This tutorial explains how to upload file in Spring 2.5 MVC Framework. Spring MVC module of Spring framework allows the developers to create web based application very easily. You can easily create file upload and form based application in Spring MVC. In this tutorial we are going to create an application which allows the user to upload a file on server. 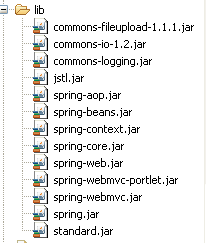 Spring MVC framework built in feature to process the file upload. This application is developed using Eclipse IDE and runs on Tomcat server. You can download the Spring MVC file upload example code at the end of this page.